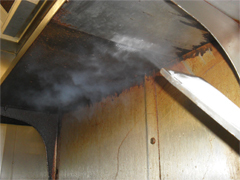 Dry Ice Blasting is a very efficient, environment friendly system of removing contaminants - paint, dirt, etc from a hard surface using Dry Ice (Co2) pellets blasted out of a gun at high pressure. Upon striking the surface two things happen. First the product being removed is hardened by the Co2 pellets and blasted away to fall to the ground as small flakes. Secondly the Co2 pellets Sublimate back into Co2 gas! So there is no waste product to contaminate the air or surrounding area, only the product you are removing, unlike sand-shot-bead blasting which creates vast amounts of dust & debris. There also is no wetness and abrasive erosion, Ideal for cleaning machinery, electric motors, food ovens etc, all can be cleaned INSITU, resulting in lower machine downtime. Machines & parts do not need to be disassembled or removed from the building. No chemicals, no blasting abrasives and no waste water! Due to this there is no contamination of mechanical parts, bearings, seals etc. There are also no costs involved in the disposal of toxic or harmful chemicals, solvents or other abrasives. Dry Ice Blasting is environmentally friendly, safe and economical, even in areas where cleaning with water or sand is prohibited. The labour input for cleaning & maintenance of machinery and production lines can be dramatically reduced by using Dry Ice Blasting. Far quicker & cleaner than traditional methods of cleaning. Dry Ice cleaning is very useful in the renovation of old property. Timber beams and doors can be stripped quickly and cleanly leaving other trades to continue work immediately after. 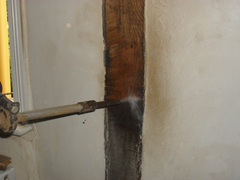 Old brickwork and stonework can also be cleaned safely because Dry Ice blasting is non abrasive. The Co2 itself is a by product of other manufacturing processes such as the chemical industry and oil and natural gas industries. Co2 is not produced separately It is always a by-product of other manufacturing processes.